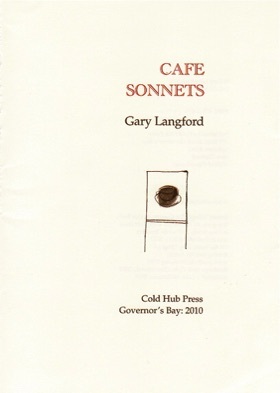 Cafe Sonnets amalgamates the recent work of the writer Gary Langford and the artist Roger Hickin. 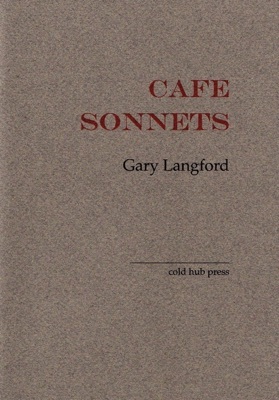 These 16 sonnets were written and performedin two cafes in Christchurch and Melbourne, reflecting Gary’s burgeoning interest in these short forms of intense language. On the Beast is a work that he has performed frequently over the years, now a sonnet on his mother. His writing often merges the serious with the comical as he does in the Sonnet Trilogy and Life Trilogy. 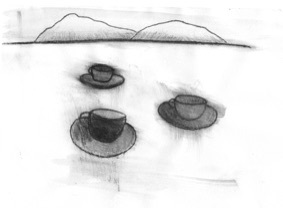 Rooted ends, ‘time is happy,’ a fitting description of Cafe Sonnets. in 2008. Presently he is coordinator, NZ Poets, The Poetry Archives, England. Time leans on us, regardless of how we are cast. Think of the number of cups you have drunk from. Imagine them across playing fields; tripped up. brushed up, blown out over the field. We nod brightly; dignity is a pale star. without a tremble, without turbulence. Suddenly we are taken aback; roots form. The soil beneath our feet gives way. crawling over each other to love us. crumbling in the dawn. Time is happy.